Hi! My name is Angela! I am a mom of two living in Hopewell Junction, New York. I have two wonderful girls and a loving husband. 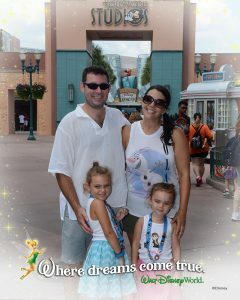 My girls and husband love Disney as much as I do. I have a background in Marketing and graduated from James Madison University. Given my background and my love for everything Disney, being a MickeyTravels authorized Disney Vacation Planner is a perfect fit for me! Walt Disney World is one of my favorite vacation spots. I started going to Walt Disney World when I was two years old. Growing up, it was my family’s favorite place to visit. Now, having my own family, we have taken them to Disney World multiple times and I really loved getting the opportunity to share that magical experience with them. I have personally been to Disneyland, Walt Disney World and Disneyland Paris. Along with being a Disney enthusiast, I am also a former Disney World cast member! While at college, I completed the Walt Disney World College Program. Having been a cast member, I know all the fun secrets to a magical Disney vacation. Planning a Disney Vacation can seem overwhelming at first, but with my help I will make it the most magical travel planning experience for you and your family. I can help plan your Walt Disney World, DisneyLand, Disney Cruise Line, Adventures by Disney and Aulani vacation. I will walk you through all the different aspects of planning a Disney vacation (dining plan options, vacation packages and park ticket options .) I will assist in planning your complete Disney experience. My service is completely FREE. I look forward to tailoring your vacation to your family’s wants and needs. Every vacation planned is specific to the family I am working with. Your vacation is a priority to me and I will help make your trip a magical one. Hi Angela! We’re thinking of planning a Disney Cruise or maybe an Adventures by Disney vacation. The Disney World vacation we took a few months ago was simply amazing, so I would never do Disney again with your help! You guys really do make magic! I’ll call you tomorrow! Julie was right! You are a Fairy Godmother, Angela! I’m so happy you were able to guide us through all of our questions and concerns. The entire vacation was better than I ever could have hoped for. We’ve made family memories that we’ll have the rest of our lives! So thankful! Everything worked out better than expected, Angela! We all had an amazing time. Thanks for all the tips and information. Magic Kingdom was magical! Dave loved Epcot! The kids loved the Kilimanjaro Safari at Animal Kingdom. We went on it twice! The fireworks had me speechless…I don’t want to leave! Just wanted to take a minute to thank you for everything!